Name: Ray Childress, aka "Scarecrow"
Don't be scared: Welcome back, fright fans, to the greatest Bust tradition no, not running the same old jokes into the ground, that's just our oldest tradition. Our greatest tradition is our annual Halloween Week, in which we feature seven of the spookiest sports cards ever printed and then run the same old jokes into the ground. 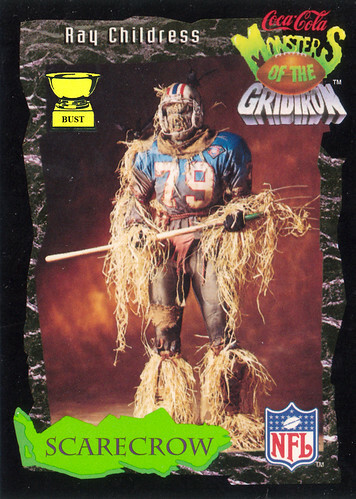 Fair warning, though: This week will feature the last of the 1994 Monsters of the Gridiron cards, meaning Halloween Week may soon be in its grave. Now that's a scary thought. Ray Childress's train of thought (if he only had a brain) from 4:10 to 4:12 p.m., June 4, 1994: "God, this is dumb. I mean, sure, the mask nearly made me soil myself the first time I saw it, but the rest of this outfit is terrible! Why are there birds on me? I thought scarecrows were supposed to keep birds away from the crops! Ugh, great, now this straw is starting to itch. Maybe if I use this fake pitchfork to scratch myself NOPE! THAT'S A REAL PITCHFORK! OWWW! Lord, I need a cigarette." (Pulls out cigarette and lights a match) "Aaannnd I'm on fire. What did you do, Ray? OK, stop, drop and roll, baby, stop, drop and roll. There, it's out, thank God. The only thing dumber than lighting that match was agreeing to this stupid photo shoot in the first place."